• PLOT SUMMARY: 80 page giant. The bad guys -- some new, some classic -- take center stage! Making their debuts: Superman's newest villainess, Encantadora (written by Joe Kelly with art by Jackson Guice), and Johnny Sorrow, a new threat with old ties to the JSA (written by Geoff Johns and David Goyer with art by Phil Winslade). 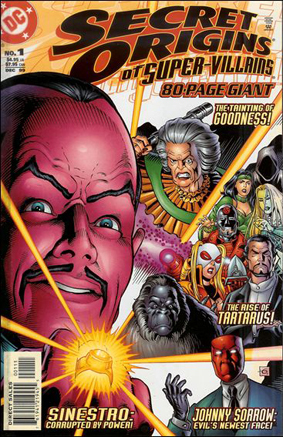 Plus, Batman foe Echo sounds off against her enemies (written by Greg Rucka with art by Rick Burchett) and readers learn...how Sinestro first became a Green Lantern (written by Ron Marz with art by Scott Kolins and Jon Holdredge); what made Granny Goodness Apokolips' best headmistress (written by Walter Simonson with art by Jon Bogdanove and Bill Reinhold); and why Amazo continues to be an ongoing threat to the JLA and Hourman (written by Tom Peyer with art by Cully Hamner). Plus, Vandal Savage organizes Gorilla Grodd, Lady Vic, Cheshire, Siren and Red Panzer into Tartarus (written by Devin Grayson with art by Drew Johnson and Jose Marzan, Jr.), the group plaguing the Titans beginning this month. Written by Joe Kelly, Geoff Johns, David Goyer, Greg Rucka, and various; art by Jackson Guice, Phil Winslade, Rick Burchett, and various. Cover art by Dave Gibbons.